Still half asleep, Michael looked up at his parents sitting on the buckboard of their covered wagon and saw an arrow penetrate his father&apos;s chest. Then he saw his mother being dragged from the wagon by two Indians. She was fighting them with all her might. He watched as one of the Indians hit her with his stone ax. His mother fell from the wagon and disappeared from his sight and from his life forever. Now he was alone. 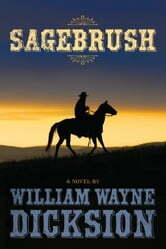 "Sagebrush" tells of how Michael survived the Indian attack and then endures alone in the vast and hostile land.